Which diet is right for your dog? 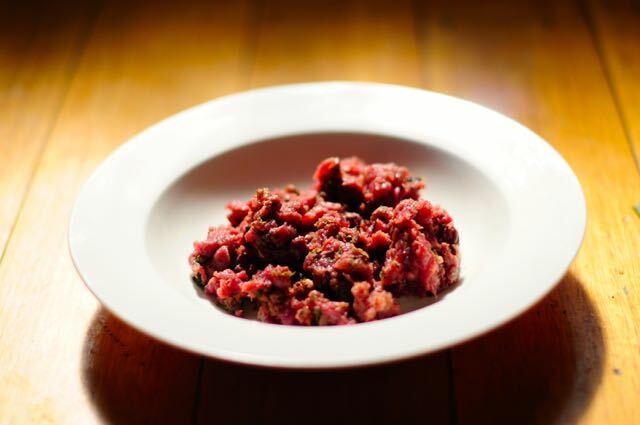 There are many different views, models, and recipes for homemade dog foods, which can make it overwhelming; how on earth do you decide which one is going to be right for your dog so you are supporting his health rather than putting it at risk? There is unfortunately no easy answer to that question; I’d love nothing more than to suggest you feed your dog this food or that food, but the reality is, your dog is an individual and there are many variables to keep in mind including your his stage of life, health conditions, previous diet, genetic predispositions and activity levels. Ultimately, choosing what to feed your dog will be a very personal decision based on these factors and your own knowledge, beliefs, values, lifestyle and circumstances. But so you are not left completely with such an unsatisfying answer, I can at least share my journey and discoveries to help you make that all important decision. First and foremost, I have no doubts that fresh, whole, species-appropriate foods in the right balance are the best things we can feed our dogs (and ourselves!) to achieve great health and wellbeing for the long run. I believe the benefits of feeding raw, real foods designed for dogs far outweighs the risks, but I have also put a lot of time and energy into educating myself about it. Fortunately for those who don’t have the time or same level of interest, there are more and more raw products coming onto the market to make it easier and convenient to feed fresh. But if you’re prepared to put in a little effort and understand the fundamentals, making your own meals for dogs can be very rewarding and potentially more cost effective. After completing a small animal nutrition course, researching many books, papers, websites, webinars, social media and blogs dedicated to the topic, I have landed on a raw feeding model that I believe benefits my dog’s health, and one which I will share over a series of blogs to help others who are making decisions about their dog’s diet. For this first blog, I will cover the very high level principles of homemade feeding – it is important to note though, that the devil is in the detail, so this overview shouldn’t be seen as a specific recipe! The general principles below are applicable for an adult dog with no significant health issues (and is not pregnant, lactating or have other special dietary needs), but you should always consider and seek appropriate advice from your pet health care professional about the individual needs of your pet*. In Australia, the minimum nutritional needs for your dog at different lifestages is determined by the The Association of American Feed Control Officials (AAFCO). All dog foods claiming to be ‘complete and balanced’ must meet the AAFCO minimum profiles. This is harder to calculate for homemade foods but you will increase the likelihood of achieving minimum nutrient needs for your dog by including the main ingredient types listed below. Achieving these proportions perfectly everyday is less important than making sure they are achieved over the course of a few days to a week. Purchase the best quality ingredients you can afford for your pet. I prefer human grade meats sourced from animals that have been raised in humane and healthy conditions (grass fed, free range etc), but appreciate that not everyone is in a position to feed that at all times. Varying your ingredients not only adds interest for your dog, but helps him achieve a wider variety of nutrients and can prevent the animal from developing food intolerances and allergies if started from an early age. It is particularly important to note that the nutrient profiles of poultry based meals can be quite different to ruminant or game meals, so recipes should vary between these meat source types to allow for the optimal balance of proteins, fats and micronutrients. 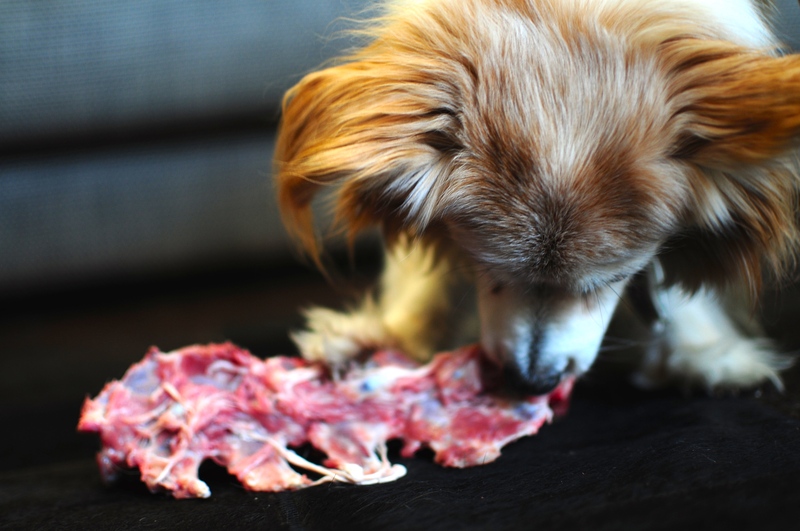 The closer a food is to its raw state, the more likely it is to retain its nutrients and enzymes, making it more available for your dog to assimilate. But there are times where raw is not always possible or ideal; dogs that have consumed processed foods may find raw foods to difficult to digest, at least initially. Some vegetables such as starchy tubers should also be cooked, and long slow cooking of bones and vegetables (discarding them afterwards) to make a broth for your dog can also be highly nutritious. You also need to practice good hygiene when dealing with raw meats (just as you would for your own meal preparation). While generally these principles apply to most dogs, you need to adapt the proportions or types of ingredients to accommodate different life stage nutrition needs (puppy growth needs are different than adults), breeds of dogs (such as giant breeds), pregnancy and lactation, and health conditions. There’s a great deal of debate about whether dogs need supplements if you are feeding species appropriate foods (such as the prey model). This would probably be the case if your dog frequently gets to eat a variety of whole wild animals as their main meals. For most of us living in urban environments and with little access to whole prey, that is going to be unlikely! Because domestic sources of meat that we are likely to be giving to our dogs can differ in their nutritional profile compared to wild sources, it is necessary to supplement their food with either vegetables, fruits and seed oils or a manufactured supplement to ensure your dog is getting at least the minimum nutrient needs it requires to stay well. You will see there are no hard and fast measures here because these ratios will vary depending on your dog’s individual needs, but I would suggest you do not (on average over the course of a few days) dip below the minimums recommended here and avoid exceeding the maximums. It is important to understand what these ingredient types consist of and how they should be prepared to maximise their absorption and minimise risk. I cover this in future posts…. If you feel going 100% raw homemade is just not for you right now, I encourage you not to dismiss it altogether. Even if you choose to include some fresh raw foods into your dog’s diet, it is a better option in my view than feeding purely processed foods. Consider making one or two meals a week for your dog using the principles above, or find a good quality raw commercial food as an alternative in between feeding your regular food. * This information is intended as a general guide to raw feeding only and is not intended to replace the individual advice or services of a professional veterinary or health care experts. Just like us, all dogs are individuals and you should take into consideration the specific needs of your pet. You can read more about how to apply these principle in the following blog entries: No bones about it, Should my dog eat vegetables and fruit?, How to serve vegetables and fruits to your dog, Offally good for your dog, Basic raw meat recipe for your dog. Here’s some resources that I have found useful in determining my dog’s homemade meals…. Billinghurst, I DVM (1993), Give Your Dog a Bone: The Practical Commonsense Way to Feed Dogs for a Long Healthy Life, Ian Billinghurst, Australia. Brown, S (2010), Unlocking the Canine Ancestral Diet, Dogwise, USA. Böhm, S (2011), Raw Food Diet for Dogs, Cadmos Books, UK. MacDonald, C (2004), Raw Dog Food – Make It Easy For You and Your Dog, DogWise, USA. Middle, C Dr (2008), Real Food for Dogs and Cats, Fremantle Press, Australia. Schultze, K (1998), Natural Nutrition for Dogs and Cats, Hay House Inc, USA. Taylor, B & Becker, K DVM (2009), Dr Becker’s Real Food for Healthy Dogs & Cats, Natural Pet Productions, USA.